The vibrant colors and exquisite design work of batik fabrics lend brilliance to everything from wall hangings and quilts to costumes and evening wear. The term "batik" refers to the intricate hand-dying process used to create the exquisite coloring. The majority of silk batik fabrics originate from Malaysia and Indonesia. Other varieties of batik, made from cotton and other natural fibers, are also available. 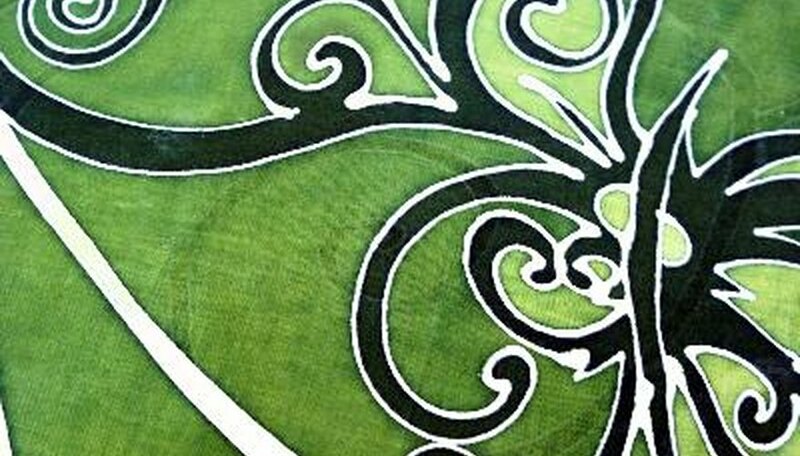 Whether you are making your own artistic fabric masterpiece or an heirloom quilt, here are some things you will need to do when working with batik fabrics. Prewash batik fabric separately from other clothing. Use hot water and a color fixative, such as Retayne, to remove any excess dye and to set the existing colors and design. Allow batik fabric to dry thoroughly, by air or very low heat setting in your dryer. Do not hang batiks in direct sunlight, as this can cause fading. Iron batik fabric (especially silk batiks) with a steam iron and a pressing cloth so that the heating plate does not come in direct contact with the fabric. Lay out batik according to pattern directions, making sure you have enough flat surface so that the fabric will lie flat. Pin pattern pieces, using silk pins, paying attention to pattern layout and also the design elements of the fabric that you may want to incorporate into your finished work. Choose a sewing machine needle with a sharp point. Needles made for work with denim, or a very fine, sharp point such as the Microtex Sharp needle are good choices for working with the high thread count of batik fabrics. Use light to medium weight silk, cotton or polyester thread when sewing batiks. Using the proper weight of thread will allow the finished piece to drape and form without bulkiness at the seams and hems. Use scissors or a rotary cutter that are dedicated only to cutting fabric to prevent any snagging or ragged edges. Silk batiks typically have little to no excess dye, while cotton and other natural fibers tend to retain more dye and will bleed if not prewashed. Purchase enough batik fabric to account for shrinkage during prewashing and to accommodate design elements.